Sloth and indolence. The eighteenth century in the Netherlands as seen by nineteenth-century authors. In the first part of the nineteenth century an almost entirely negative view of the previous century established itself in the Netherlands. The eighteenth century had been a period of political decline, in which the Dutch Republic lost most of its former power and international prestige. This decline was generally ascribed to the effects of luxury, such as a lack of initiative, imitation of foreign models and moral corruption. In this essay, the tenacity of this view of the eighteenth century in Dutch historiography and literary history is traced until the first part of the twentieth century. The standard of judgement remained the Dutch Golden Age in the seventeenth century, as can be clearly seen in the writings of Conrad Busken Huet, whose comments on a number of eighteenth-century novels are discussed in some detail. The renewed national confidence of the later nineteenth century did not lead to a change of opinion. Even the revolutionary movement of the 1780s was by then often ridiculed as an exercise in futility. A historian like Johan Huizinga at some points expressed his doubts about the prevailing views, but the foundations of a complete historical revaluation were laid only during the 1950s. The century of unbelief. Constructing the enlightened eighteenth century in Groen van Prinsterer’s Ongeloof en Revolutie (1847). This article analyses the construction of the ‘eighteenth century’ as a historical concept in the treatise Ongeloof en Revolutie (Unbelief and Revolution) (1847) by the Dutch protestant statesman and critic of the Enlightenment Guillaume Groen van Prinsterer (1801-1876). In this work, which describes and laments the rise of ‘unbelief’ in eighteenth-century Europe, Groen paradoxally creates the idea of a homogenous and atheistic eighteenth century, building on an older tradition of protestant criticism of enlightened philosophy. Despite his critical stance Groen also values the eighteenth century for its dynamism and sees this century as a crucial epoch in European and Dutch history. The article draws parallels between the Dutch protestant and the French catholic conceptualisation of the enlightened eighteenth century, and advocates a comparative and transnational study of early conservative and anti-enlightened thought. 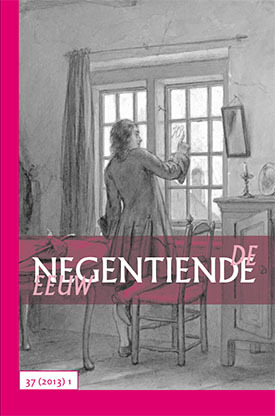 Jean-Jacques Rousseau’s Confessions in the Netherlands in the nineteenth century. After its publication in 1782, Jean-Jacques Rousseau’s Confessions were often read and discussed in the Netherlands. Although the work was not translated in Dutch until more than a century later, just like elsewhere in Europe, many Dutch writers considered Rousseau’s Confessions to be a milestone in the developing genre of autobiography. Dutchmen without knowledge of French could get acquainted with its content through reviews and discussions in the press. Nevertheless, like Rousseau’s earlier works, the Confessions provoked mixed and often ambivalent reactions. As a case study the changing attitude of Dutch author Eduard Douwes Dekker – Multatuli –, towards Rousseau’s Confessions is distilled from his works and letters. In his younger years Douwes Dekker jokingly announced to write his own Confessions, but in old age wrote that he would never do that, fearing the public discussion that had always surrounded Rousseau’s work would also affect him. That is, however, in itself a sign of the influence of Rousseau’s controversial autobiography. A century of rummaging antiquarians. G.D.J. Schotel’s take on eighteenth-century philology. Gilles Dionysius Jacobus Schotel (1807-1892) was a pastor and an amateur philologist in a peripheral area of the Netherlands. Historians of later times placed his work in the periphery of philological knowledge production as well. This article places Schotel back in both the productive tradition of antiquarianism and in the nineteenth-century vogue of literary historicism and the dominant historicist culture. It focuses in particular on the connotation of his antiquarian work and practices with the eighteenth century. Such an image was created by Schotel himself: he identified with Walter Scott’s eighteenth-century antiquarian and he commemorated two eighteenth-century scholars in particular, Cornelis van Alkemade and Pieter van der Schelling. Schotel even followed their example in his own practices of knowledge production: he collected books and historical documents and he made them accessible to others through an intensive correspondence network. His academic ambitions, however, remained unfulfilled and he failed in continuing Van der Aa’s Biografisch woordenboek van Nederland as a project of scholarly collaboration. Schotel clearly missed ongoing processes of institutionalisation and specialisation that turned Dutch linguistics, literature and history into modern academic disciplines. Thus, Schotel’s life and work are an excellent case to reveal how antiquarianism was appreciated as an eighteenth-century tradition but paled beside the nineteenth-century triumph of modern humanities. Solace and wit. The 18th century in the work of painter David Bles. The 18th century as a subject for paintings was not popular in 19th century Dutch art, as the era was seen as an age of decline, in art as well as in morals. It is therefore striking that the painter David Bles nevertheless created a hugely successful niche of his own with conversation pieces set in 18th century interiors. Apart from his virtuoso drawing and brilliant use of colour, his ironic rendering of the 18th century Dutch bourgeois seems to have struck a cord. Bles’s art concurs with a more general revival of the rococo period in Europe, from Hogarthian scenes painted by modern English painters to the brothers de Goncourt in Paris. The Dutch 18th century painter Cornelis Troost (whose name translates as solace) provided another example for Bles, though the latter’s use of humour was more refined. According to critics it was Bles’s witticism that defined him as a typically Dutch artist. Notwithstanding his love for a period not well thought of, his irony made him into a worthy follower of a tradition begun by Jan Steen.